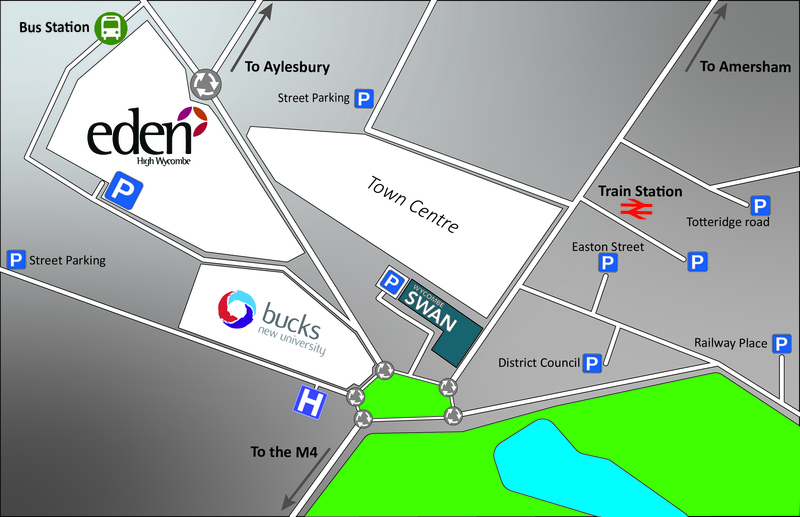 Wycombe Swan Theatre is located in the heart of High Wycombe, and it's easy to get here no matter how you travel. Entrance to the Main Theatre is via the Ticket Office on St Mary's Street. Ticket Office is open Mon - Sat from 10am-6pm and 90 minutes before shows on a Sunday or Bank Holidays. The foyers are opened 2 ½ hours before a show Mon - Sat, and 1 hour 30 mins before on a Sun. Arriva are the principal bus operator in the High Wycombe Area, with routes serving all of the major urban and rural areas. High Wycombe's bus station is located within walking distance to the theatre. Wycombe District Council have allocated a drop-off/pick-up point for coaches and minibuses outside the entrance to the theatre located on St Mary Street. Please be advised this is a no waiting area. There is coach and minibus parking available at Bellfield car park (payable) and at the park and ride car park situated at Cressex, High Wycombe. For further details on bus/coach parking, please visit the Wycombe District Council Website . Wycombe Swan Theatre is located on St. Mary Street, High Wycombe, Buckinghamshire HP11 2XE. The theatre is in the centre of High Wycombe, 5 minutes from Junction 4 of the M40, only 40 minutes from the centre of London or Oxford (M40/A40), and 30 minutes away from both Aylesbury (A4010) and Reading (A4010/M4/A4). The Park and Ride service is ideal for matinees and is great value. Running every 15 minutes from 7am to 8.15pm Mondays to Fridays and from 8am to 7.15pm on Saturdays the easy access buses take you right to Wycombe Swan's Town Hall entrance. The spacious and secure free car park is at Cressex, signed from the M40 Junction 4 at Handy Cross and from the A4010 at Chapel Lane. More information can be found at www.wycombeparkandride.com.